When Amazon first trotted out the Kindle Paperwhite, it was the first two-tone ereader in a long time (possibly ever) to have wow factor. And that front-lit screen turned out to be just as beautiful as promised. 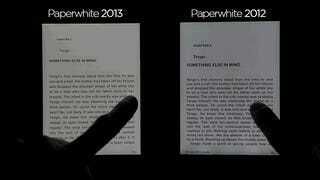 A year later, the new Amazon Paperwhite is just a tad better than its predecessor. Yes, that means the new Kindle Paperwhite is still the best. An iterative update of Amazon's top ereader featuring an improved screen, a faster processor, and some new software. The basic Wi-Fi model with special offers that sit on your lockscreen costs $120. The 3G version costs $190. In both cases, you can abolish the advertisements for $30 extra dollars. 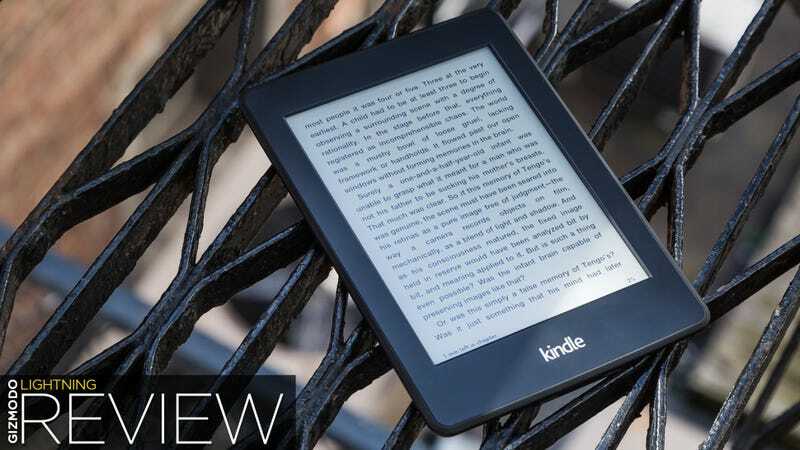 Last year's Kindle Paperwhite was the best ereader in the world. This year's will probably follow suit. People who want to utilize an electronic reader. People who do not wish to carry around stacks of bound paper in their backpacks and pockets. Folks who can't stand to read on a typical tablet screen. The same smokey-black, soft-touch rectangle last year. The new model is slightly lighter than the previous model. I was able to distinguish the weight 100-percent of the time in a blind test, but you'll never notice the difference when the ereader is in your breast pocket. The etched writing on the back now says "Amazon" instead of "Kindle" just like the Kindle Fire HDX. Though this isn't a huge overhaul, a side-by-side comparison of the new Paperwhite with last year's model reveals several huge improvements. The new screen is gorgeous and whiter than before. It really is a lot more attractive and easier to read than the previous model, which looks blue and unevenly lit by comparison. The text on the new display has finer lines than before. The overall performance of the device is also noticeably faster. The pages turn quicker than before, but how much faster varied a bit as the GIFs below illustrate. The periodic flashes that the ereader uses to refresh the e-ink display come less than half as often as before. The new Kindle refreshes every 13 or 14 pages from about every 5 pages. If like me, you find the screen flashes a little distracting, this is a welcome improvement. The special offers that linger on your lockscreen are just tacky beyond justifiability. It's tackier still that you need to pay to get rid of them. But fortunately, that's an option. The new Kindle features a bunch of new software, most of which doesn't really change the core reading experience. Probably the most useful is the overhauled Page Flop browser. Now, as you drag your finger to scroll through the pages of a book, a little picture-in-picture viewer shows you a preview of the page you've "flipped" to. From there, you can either jump to the page or close out of it. The overall experience is a delicious analogue to actually flipping through a book. Other new software additions like the vocabulary builder with flashcards are nice but non-essential additions to the package. I've never really found 3G connectivity to be all that important on an ereader, and the same holds true here. Just sync it up when you've got access to Wi-Fi, and move on. Yes, you most definitely should! But if you already own last year's Paperwhite, the improvements aren't enough to justify an upgrade. If for whatever reason you don't own an ereader or are still on an old-school Amazon model though, what are you waiting for? This thing is dope. The Wi-Fi model will be plenty for most people, and if you're going to splurge, I'd recommend spending an extra $30 for the model without special offers. And enjoy some good readin', like a cultured, intelligent adult.